Is your child named after a rollercoaster? Coaster mad dads who’ve named their kids after rides and attractions at the UK’s number one theme park are being sought ahead of Fathers’ Day this Sunday (June 17). Alton Towers Resort is appealing for dads who’ve given their offspring names inspired by rides at the Staffordshire based Theme Park to come forward and receive a special treat including a VIP Golden Ticket to the park and the chance to ride Wicker Man, the resort’s new wooden roller coaster, which is referred to by fans as a ‘woody’ or ‘woodie’. Since it opened in 1980 staff at the Resort have regularly been told of babies who have been named after some of the most iconic rides and attractions, thanks to their parents’ passions for all things Alton Towers. That includes at least one inspired by Wicker Man, which opened earlier this year. Theme park enthusiast Gary Rogers, 39 from Glossop, runs rollercoaster image site Attraction Images. He and his wife welcomed their son ‘Alton Woody’ Rogers-Brennan into the world in 2016, when work was just beginning on the new Wicker Man ride. Data from the Office for National Statistics shows that between 1996 and 2016 more than 760 babies were listed as being registered with first names that also have a link to Alton Towers Resort including Alton, Blade and Woodie. Yet the theme park is keen to find any more unusual names linked to the park such as Oblivion, Nemesis and Smiler that may have been used as middle names. 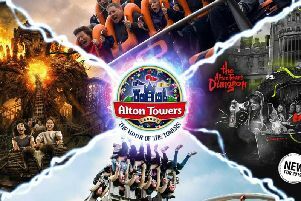 James Walker, marketing director at Alton Towers Resort, said: “After four years of development it’s great to see how enthusiastic the Alton Towers fans are about our new creation. And there is no greater tribute than naming a child after your favourite rollercoaster. Those who have a child with a registered name related to Alton Towers Resort should email ATPress.Office@alton-towers.com including their name, location, child’s name and details about the choice of child’s name and why it was chosen before midnight on Tuesday, June 12.